Transit customers benefit when agencies collaborate to create comprehensive maps that display each other’s services. I published the New York & New Jersey Subway Map as a proof-of-concept to demonstrate how a single map could give people a comprehensive, harmonized view of the transit options available throughout the region. It is based on the design of the New York City Subway Map, one of the most recognizable transit wayfinding tools in the world, and incorporates subway, light rail, regional and intercity rail, and ferry services. Tens of thousands of riders now use the New York & New Jersey Subway Map to help them navigate the NYC metro area. The Philadelphia Rail Transit Map is an excellent example of interagency collaboration in action. It shows rapid transit services provided by the Southeastern Pennsylvania Transportation Authority (SEPTA), which operates most lines, and Delaware River Port Authority, which operates the PATCO Line connecting Philadelphia with Camden and several other points in New Jersey. 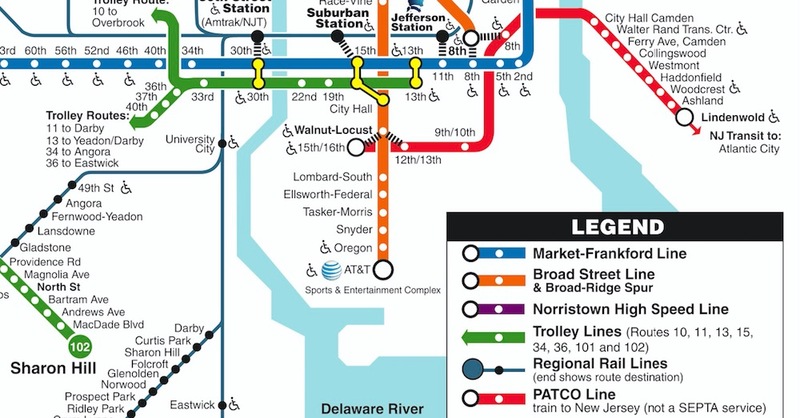 The SEPTA map key includes the disclaimer “not a SEPTA service” next to the PATCO Line, but represents the line using a visual style consistent with all other rapid transit lines in Philadelphia.